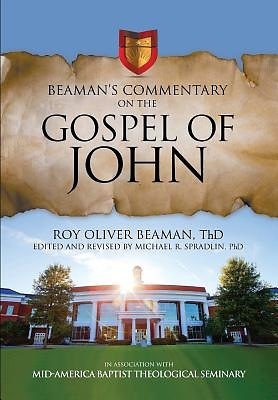 The discovery of a commentary written (but never published) by Dr. Roy Beaman Th.D., longtime seminary professor and New Testament scholar, brings his unique biblical insights to light. Roy Beaman combined the talents of a linguist, a New Testament scholar, and a biblical archaeologist. His commentary on the Gospel of John was developed for almost four decades and taught repeatedly in churches and in seminary classrooms. Though the manuscript was never published, printed copies were distributed through the years. Beaman's Commentary on the Gospel of John is the compilation of two of those manuscripts. Edited and revised by Michael R. Spradlin, Ph.D., President Mid-America Baptist Theological Seminary, this 308-page commentary on the Gospel of John will serve the scholar seeking deeper information and the believer seeking devotional insights. ABOUT THE EDITOR: Michael R. Spradlin, PhD, is the author of Sons of the 43rd and numerous articles on church history, missions, and evangelism. He has served for many years as the president of Mid-America Baptist Theological Seminary and is a member of Mid-America's church history faculty. He has lectured extensively throughout the United States and around the world. ABOUT THE AUTHOR: Roy O. Beaman, ThD (1904-1996), preached and taught in a career that spanned sixty years of ministry and theological education. He was a gifted linguist, Bible scholar, and theologian who shared his love of the scriptures and his love for the Lord Jesus with all who met him. He combined a gracious spirit with rock-solid biblical convictions that influenced several generations of pastors and theologians. ABOUT THE PUBLISHER: Innovo Publishing is a Christian publisher located in Collierville, TN. Since 2008, Innovo has been publishing quality books, eBooks, audiobooks, music, and film that support the Great Commission, equip believers and help create a positive Christian worldview. Innovo's extensive capabilities and global reach provide Christian authors, artists and ministries access to the world for Christ. To learn more, visit Innovo Publishing at innovopublishing.com, and visit Innovo's Children's imprint--WRITESIE--at writesie.com.